A political storm surrounding the African cargo pirated from the underbelly of the San Juan Bautista by two English corsairs in 1619 lends to Virginia becoming America’s first colony. 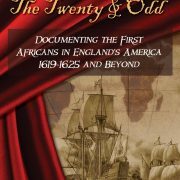 JOIN THE JOURNEY as 1619 GENEALOGY names the first “twenty and odd” Africans to arrive in the small English settlement of Virginia. https://kinfolkdetective.com/wp-content/uploads/2016/03/1619-logo-square.jpg 1000 1000 Kinfolk Detective https://kinfolkdetective.com/wp-content/uploads/2015/11/headerlogo3.png Kinfolk Detective2016-03-17 23:28:392018-11-09 06:45:201619 Genealogy - Descendants of the first "Twenty and Odd"
On May 18th, 2019 “Unveiled – The Twenty & Odd” will be released! This work will leave the world scratching its head, wondering where the current narrative regarding the first Africans came from. 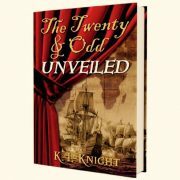 “Unveiled – The Twenty & Odd” will correct the narrative surrounding their landing, their numbers, and the events which effected their status. For instance, did you know the first Africans held indentures? Anthony wasn’t the only African to have his freedom acknowledged in the court records. From 1635-1640, many of the first Africans are released from indenture and have become headrights. Eventually, they own land and establish farms and trades which many of the Europeans became dependent upon. 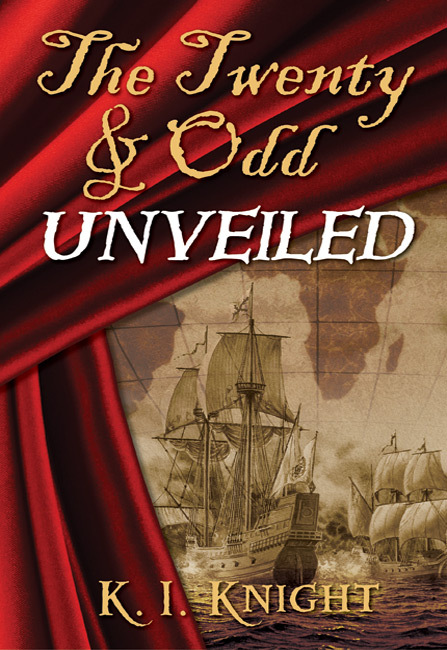 Hope you’re ready… “Unveiled – The Twenty & Odd” will bring a new understanding about the first Africans who landed in the English settlement of Virginia 400 years ago. 1619-2019.
https://kinfolkdetective.com/wp-content/uploads/2019/03/Unveiled-Book-cover.jpg 1612 1080 Kinfolk Detective https://kinfolkdetective.com/wp-content/uploads/2015/11/headerlogo3.png Kinfolk Detective2019-03-26 13:10:472019-03-26 17:41:46"Unveiled - The Twenty & Odd" to be released! 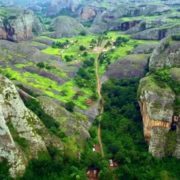 One of the Wonders of Africa… the Black Rocks at Pungo are a series of mystical rock formations standing 350 feet (107 meters) high above Angola’s African Savanna. Believed to be the location of the Kingdom of Ndongo in 1618-1619 when the kingdom was raided by the Portuguese contracted Imbangala. The survivors, stripped of their belongings and bound, are marched to the Port of Luanda and sold as slaves. Three hundred fifty (350) are sold to Don Manuel Mendez de Acuna, Captain of the San Juan Bautista. By chance, two English warships pirate the San Juan Bautista and the stolen Africans are brought to the English settlement of Virginia arriving the latter part of August, 1619. The attached pictures shows the mapped location of Ndongo along with a current picture of the mystical Black Rocks at Pungo Andongo. One of the most documented early Africans to arrive in Virginia was Anthony/Antonio. Records show Anthony/Antonio arrived in Virginia on the ship ‘James’ from England in 1621. Was he one of the first “twenty and odd” sold on the shores of the James River in August of 1619? The short answer is NO. However, its slightly more complicated than that. Anthony/Antonio was among at least two others who found their way to Virginia from the pirating of the San Juan Bautista in the Bay of Campeche in the summer of 1619. The San Juan Bautista is the same slave ship the first “twenty and odd” were pirated from. Anthony/Antonio’s path would be slightly different than the “twenty and odd” who arrived on the White Lion. From the San Juan Bautista, Anthony/Antonio was put aboard the Treasurer, which arrived at Point Comfort three days after the White Lion. The Treasurer would be turned away or “warned” off allowing its Captain, Daniel Elfrith, to sail to Bermuda. Anthony/Antonio would remain in Bermuda until 1621 when Gov. Butler would put him and two other Africans/Angolans aboard the ship “James” sailing for the Port of Southampton, England. Once in the English port the three Africans/Angolans were taken to Robert Rich / Earl of Warwick’s Felsted estate, Leighs (Leez) Priory. Before the end of 1621, Anthony/Antonio would be brought back to the south shore of the James River and indentured to Robert Bennett of Bennett’s Plantation also known as Warrosquarak. There he would survive the great massacre of 1622 and remain in the area for nearly 30 years. Anthony/Antonio was one of America’s first FREE Africans. Mary, like Anthony/Antonio, was among the African slaves pirated from the San Juan Bautista in the Bay of Campeche, 500 miles from their destination of Vera Cruz, Mexico. Mary was put aboard the “Treasurer” which arrived at Old Point Comfort, Virginia three days after the “White Lion.” Warned of the pirating charges the Captain would face the Treasurer would disappear from the James River and reappear in Bermuda with a cargo of Africans. Mary, like Anthony/Antonio was among them. In 1621, Mary would be put aboard the ship James, sailing from Bermuda for the port of Southampton, England where she would be taken with Anthony/Antonio and one other African to Robert Rich’s Estate in Felsted, England known as Leighs (Leez) Priory. In mid 1622, six months after Anthony/Antonio was removed from Leighs/Leez Priory Mary was put aboard the English ship “Margaret & John” sailing to Virginia. By 1623, Mary would be listed on a muster, like Anthony/Antonio, at Bennett’s plantation on the south side of the James River in the area called Warrasquarak. Later, Mary would marry Anthony and they would be known as Mr. and Mrs. Anthony Johnson. By 1644, they would have four children, two boys and two girls. Like Antonio/Anthony and Maria/Mary, John Pedro was among the San Juan Bautista survivors brought to Bermuda on the “Treasurer” in 1619. John Pedro is the third and last African to be put aboard the “James” in 1621 sailing for the English port of Southampton and delivered to Robert Rich’s estate in Felsted, England known as Leighs (Leez) Priory. Where the other two Africans (Antonio/Anthony and Maria/Mary) were sent from England to Virginia, John Pedro, a catholic, would take a different route. In 1622 John Pedro was placed on the “Swan,” one of Robert Rich’s ships, sailing for Cape Cod, New England. Within the year John Pedro would make his way to Virginia with Captain Francis West. In 1623, John Pedro is listed on the muster at Captain Francis West’s plantation at the Eastern Shore where he would remain until West’s death in January of 1634. Interesting fact: The Angolan kingdom raided by the Portuguese in 1618/1619 where the San Juan Bautista survivors were enslaved was documented as a Catholic community. John Pedro would be the first openly practicing Catholic in Virginia’s early Anglican settlement. WHY DID ANTHONY, MARY AND JOHN PEDRO FIND THEMSELVES IN ENGLAND IN 1621? Antonio/Anthony, Maria/Mary and John Pedro were taken to Leighs (Leez) Priory, the estate of Robert Rich II, Earl of Warwick in Felsted, England in 1621 as an aristocrat’s attempt to cement a political charade. The Earl of Warwick was fully engaged in a court battle with Count Gondomar, the Spanish Ambassador in King James’ English court, over the Piracy of the San Juan Bautista’s Africans. As FATE would have it, the Captain of the San Juan Bautista pirated by Rich’s Treasurer in the summer of 1619 was no less than Count Gondomar’s kin. By 1621, deep within the court case, Gondomar is rabidly demanding his African slaves to be returned to his family’s possession. Believing he could convince Anthony, Mary and John Pedro to twist their testimony in his favor, the Earl of Warwick brings Anthony to testify before the court. But, Anthony would not falsify his testimony and claims there were two ships at the raid, the White Lion and Rich’s Treasurer. Instantly Rich/Earl of Warwick declares Anthony’s testimony invalid bringing to light the fact Anthony’s baptismal was unverifiable. 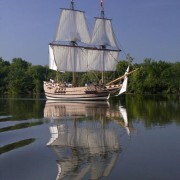 Angry over his testimony and unable to wait, Rich puts Anthony aboard the “James” shipping him to Bennett’s plantation on the south shore of the James River. Mary and John Pedro follow as soon as the harsh winter months pass. The Angolan kingdom raided by the Portuguese in 1618/1619 where the San Juan Bautista survivors were captured and enslaved was documented as a Catholic community. John Pedro would be the first openly practicing Catholic in Virginia’s early Anglican settlement. Robert Rich was a Puritan leader as was Edward Bennett of Bennett’s Plantation. Bennett’s plantation is the only puritan plantation in all of the Anglican settlement of Virginia until 1624 when Virginia becomes an English colony. In the beginning, I didn’t understand where the desire came. I just knew it was there. The desire quickly became a passion and consequently an addiction. Nine years ago, looking for my husband’s ancestors, I came across a woman whose allure was irresistible. 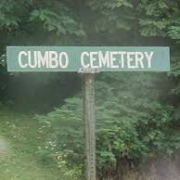 As a genealogist, I find many significant people with vital stories throughout history. Why was this one so overwhelmingly important? Her name was Margaret Cornish. She was one of the first Africans to arrive in the English settlement of Virginia in 1619. The desire to understand where she came from and how she found herself in an English settlement became intoxicating. Every hour of every day filled with questions overwhelming my senses. My husband’s 9th generation great-grandmother had captured my mind like she was captured by the marauders of her kingdom almost four-hundred years ago. Some 20,000 + hours of research turned into a series of novels with the first book winning a national gold medal. But, the grandest surprise was yet to come. 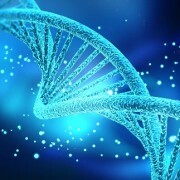 As my own 97-year-old grandmother’s health began to fail, and with her tireless urging, I collected her DNA. Then in June of 2014 her spirit passed into the land of our ancestors and I said goodbye to a woman of unwavering faith. Simultaneously, I received her DNA results and the explanation of my addiction quickly became crystal clear. Margaret Cornish wasn’t only my husband’s ancestor, but mine as well. With tears of joy streaming down my face I began to understand. The addiction I felt was a scream from within myself. A memory from within my own DNA begging to be heard. Finally, I understood my fate was deep within my own DNA. A story of an ancestor begging to be told. Join my journey as I take you down the path of Margaret Cornish’s life, one of FATE & FREEDOM. 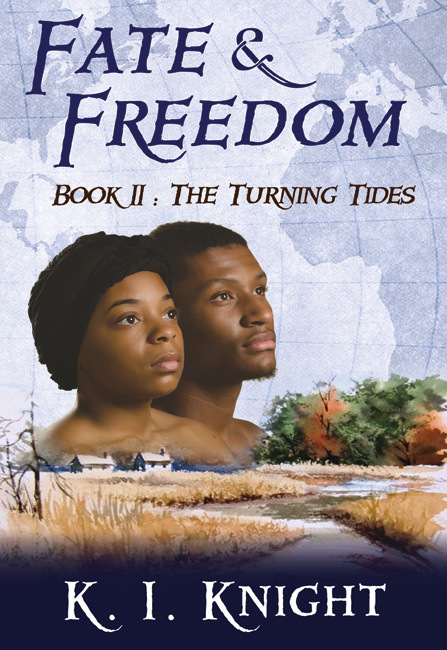 The Driggers’ should be known as one of the America’s earliest FREEDOM FIGHTERS. In February of 1623 at Bennett’s plantation Frances is listed with her son Peter in the list of the Living. Frances was listed in Piercey’s Muster at Flowerdew Plantation in the 1624/25 as an African woman with young child of hers, which we now know is Peter. Other than a listing of a African man, Emmanuel is not named until the 1640’s. Emmanuel Driggers marries Frances prior to 1640 in Northampton County, Virginia. They had at least seven (7) children, of which two were not their natural born children. 2. Jane, born May 1644 and noted as one (1) year old on 27th of May, 1645 when Emmanuel bound her to Captain Francis Pott to serve him until the age of thirty-one (31). Like Elizabeth, (above) Jane was not their biological daughter since her indenture read: “bought and paid for to Captain Robert Shepard” On May 24, 1652, Driggers paid for the balance of Jane’s indenture, freeing and releasing her from Potts. Note: Jane was the biological child of Margaret Cornish and Robert Sweat of Robert Shepard’s household. She was one of four children born of this relationship. Frances, Emmanuel’s wife died before 1656 when he took a second wife named Elizabeth, an English woman. Emmanuel and Frances Driggers along with most of their children received their freedom during a time when legalized slavery was emerging in Virginia. How you ask? The foresight and understanding of the English legal system. Recording their contracts of indentured servitude set an end date to their indentured time. 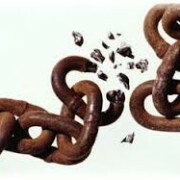 Legally freeing them from servitude and allowing their FREEDOM! Lawnes Creek Parish Tithables 1668-1669 Surry County, Virginia. First African Woman to Pay her Own Tithes! I visited Surry County, Virginia this past week to locate Lawnes Creek Parish. 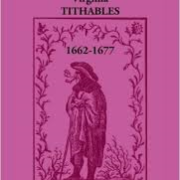 Listed in the Surry County Tithables 1668-1669, Lawnes Creek Parish is Margaret Cornish. The first AFRICAN woman to pay her own tithes/taxes and own her home. 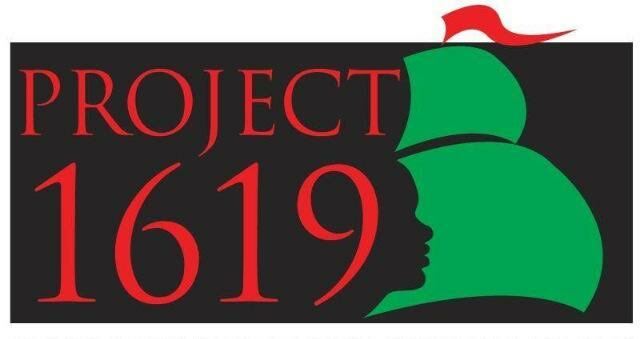 What an amazing accomplishment in 1668-1669, just one year after slavery is legalized in Virginia. 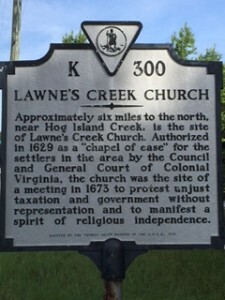 This historic marker locates the Lawnes Creek Church. https://kinfolkdetective.com/wp-content/uploads/2015/08/Lawnes-Creek-Parish-e1440520676166.jpg 320 240 Kinfolk Detective https://kinfolkdetective.com/wp-content/uploads/2015/11/headerlogo3.png Kinfolk Detective2015-08-25 12:53:282016-02-23 15:49:21Lawnes Creek Parish Tithables 1668-1669 Surry County, Virginia. 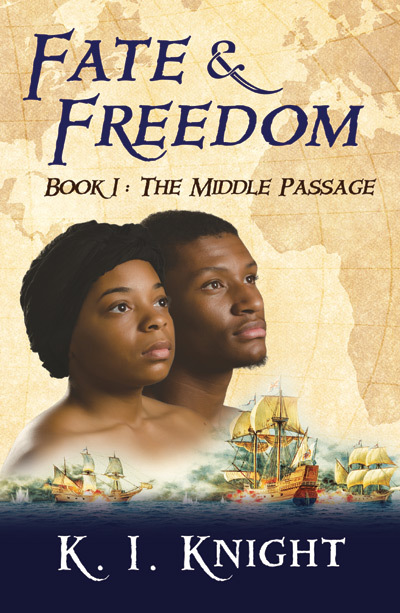 Torn from their homeland in Africa by brutal slave traders and put aboard a slave ship bound for Mexico, Margaret and John are unexpectedly rescued at sea by a daring English privateer. They are taken to the shores of Virginia where their arrival brings a rain of political fire down upon the Virginia Company of London, ultimately changing the New World forever. 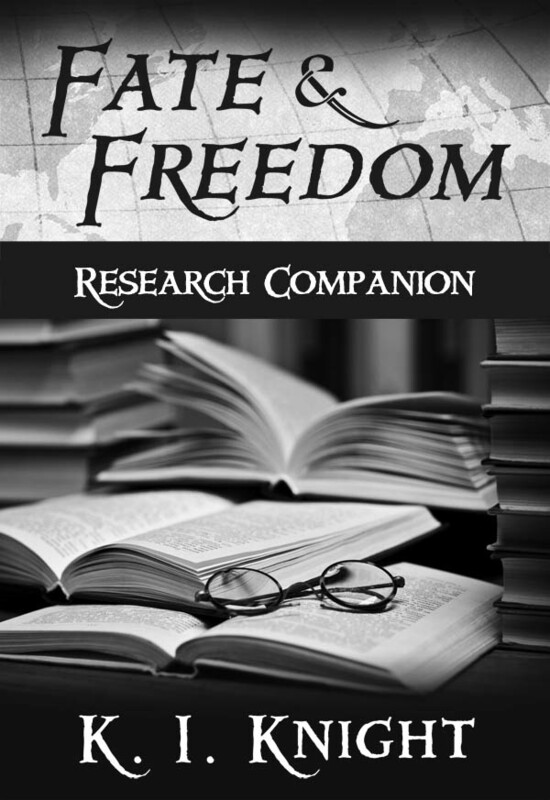 The Research Companion will be released along with the last book in the series.